The management of hemodynamic stability in shock patients is of paramount importance in the intensive care unit (ICU). New, cutting edge knowledge is necessary to overcome the shortcomings of available therapies, which are targeted to reduce symptoms of shock and multiple organ failure. However, they are unable to target the root cause or to act at the “beginning of the cascade”, because of the lack of a model explaining the molecular basis of shock-induced tissue injury and ensuing multiple organ failure. Hence, the effectiveness of anti-hypotensive interventions, such as fluid resuscitation, is limited. Fluid may restore blood pressure within minutes, but complications such as pulmonary edema may arise on a longer time scale in patients who are unresponsive to fluid infusion, and cause more severe stress to the patient’s hemodynamic stability, respiratory efficiency, and immune system. The ShockOmics project focused on the molecular triggers of acute heart failure in association to shock, in the presence of uncontrolled proteolytic activity, in order to identify inflammatory mediators and markers which are activated in shock, through a systematic analysis of expression levels of genes and their protein products, and novel targets for the delivery of new therapies. In this framework, several biosample and data sources were integrated by clinical records and hemodynamic monitoring: i) plasma samples from existing biobanks; ii) clinical studies in septic shock (SS) and cardiogenic shock (CS) patients in ICU sampled at T1<16h, T2=48h, T3=7day after shock onset; iii) animal shock models include hemorrhagic shock (HS) rats, HS swines, SS swines, and CS swines; iv) in-vitro cardiomyocytes shock models. Analyses spanned all omics technologies (metabolomics, proteomics, peptidomics, and transcriptomics) addressing the circulating blood/plasma and, in animals, post-mortem samples of the myocardial tissue. Omics outcomes were integrated with clinical indexes and parameters relevant to cardiovascular (CV) regulation from hemodynamic monitoring. Artificial intelligence and data-mining methods were applied to work out risk prediction algorithms. Therapeutic advancements were pursued starting from the “autodigestion hypothesis”, which focuses the detrimental proteolytic effects from digestive enzymes leaking from the intestinal compartment via the wall damaged by the ongoing shock. This pushed to confirm previous experiments on rats both in the same species and in the swine shock models. The latter experiments asked to further develop technologies for intestinal infusion through the naso-gastric access beyond the pylorus by a dedicated infusion line and smart control pumps. Plans for the future exploitation of the project outcomes address three areas: i) risk prediction algorithms to be integrated into existing cardiovascular monitors or addressing the omics outcomes; ii) future development of diagnostic-kits addressing the potential biomarkers; iii) the drug delivery technologies into the intestinal lumen. Aletti F. et al. “ShockOmics: multiscale approach to the identification of molecular biomarkers in acute heart failure induced by shock.” Scandinavian journal of trauma, resuscitation and emergency medicine 24.1 (2016): 9. Carrara M. et al. “Baroreflex sensitivity and blood pressure variability can help in understanding the different response to therapy during acute phase of septic shock.” Shock (Augusta, Ga.) 50.1 (2018): 78. Carrara M. et al. “Blood pressure variability, heart functionality and left ventricular tissue alterations in a protocol of severe hemorrhagic shock and resuscitation.” Journal of Applied Physiology (2018). In our clinical studies we observed that, although patients reached the mean BP target of 65 mmHg, important differences in terms of autonomic nervous system control were measured. BP variability, HR variability and baroreflex trends can add information to individual vital sign measure such as mean BP, and can help in understanding the responsiveness to the combination of symphatomimetic drugs and fluid therapy. Moreover, it is a common evidence that patients in septic shock (SS) receive excess fluids even after they are weaned from vasopressors. In our opinion, this happens because indices relating to CV autonomic control are not commonly used to guide fluid therapy and our work is meant to contribute in this direction. Hence, CV regulation indices offer a non-invasive options to guide fluid therapy and permit to assess the hemodynamic response of patients to the therapy. 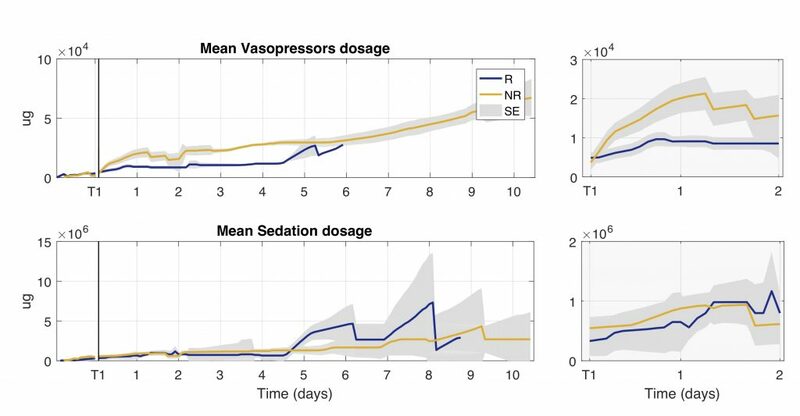 Figure: Trend of cumulative total dosage of vasopressors and sedation drugs administered during the first 10 days of ICU stay for groups of responder (R) and non-responder (NR) patients. Total dosage is computed as the sum of all the drugs administered every 2 h. The gray shaded area represents the standard error (SE). These findings were confirmed in HS swine experiments, showing that the evaluation of the autonomic nervous system could be valuable in determining the effectiveness of the therapy and the grade of recovery. We assessed the effects of severe hemorrhage on heart functionality by integrating the hemodynamic findings with measures of plasma high-sensitivity cardiac troponin T and metabolite concentrations in left ventricular (LV) tissue. Resuscitation was performed with fluids and norepinephrine and then by reinfusion of shed blood. After first resuscitation, mean BP reached the target value, but cardiovascular indexes were not fully restored, hinting at a partial recovery of the autonomic mechanisms. Moreover, cardiac troponins were still elevated, suggesting a persistent myocardial sufferance. After blood reinfusion all the indexes returned to baseline. In the harvested heart, LV metabolic profile confirmed the acute stress condition sensed by the cardiomyocytes. Variability indexes and baroreflex trends can be valuable tools to evaluate the severity of HS, and they may represent a more useful end point for resuscitation in combination with standard measures such as mean values and biological measures. Cambiaghi A., et al. “Characterization of a metabolomic profile associated with responsiveness to therapy in the acute phase of septic shock.” Scientific reports 7.1 (2017): 9748. By combining mass spectrometry-based untarget and target metabolomics approaches, many dysregulated metabolic pathways ranging from energy and lipid metabolism to amino acids synthesis were observed in shock patients. We made a comprehensive metabolomics study of septic shock patients stratified as responders (R) and not responders (NR) to standard therapy on the basis of the changes in SOFA score in the first two days in the ICU. Changes in the levels of metabolites over time were shown to discriminate positive response to therapy. Metabolomics data elaboration by datamining techniques revealed that the metabolic trajectory during the first 48 hours after ICU admission in NR patients was characterized by significant lipidome alterations. The reduction in circulating lysophosphatidylcholines (LysoPC) in NR patients might reflect their enhanced conversion to lysophosphatidic acid, which induces a multitude of cellular responses through its action on immunologically relevant cells and might also promote an excessive immune response, with detrimental effect in NR patients. NR patients also showed a marked decrease in phosphatidylcholine species (PC), which originate in the liver. The imbalance of LysoPC/PCs cycling suggested that hepatic homeostasis and function is compromised even before any clinical manifestation. We showed also that the level of sPLA2-IIA significantly decreased together with an increase of lysoPC species (i.e. lysoPC C16:00 and C18:0) in R patients only. This result is in line with other experimental evidence that reduction of sPLA2-IIA may slow down the inflammatory cascade and increase the probability of responsiveness to therapy. Indeed, the higher plasma level of alanine found in NR vs R may be a sign of lower hepatic capacity for conversion of alanine to glucose and suggests a different approach for monitoring hepatic function, which will be more specific than bilirubin. Figure: Three-dimensional PLS-DA score plots on 20 features for targeted metabolomics model (panel A) and for targeted and untargeted metabolomics model (panel B). Patients are grouped as responders (R) and not responders (NR) to standard therapy on the basis of the changes in SOFA score. Cambiaghi A. et al. “An Innovative Approach for The Integration of Proteomics and Metabolomics Data In Severe Septic Shock Patients Stratified for Mortality.” Scientific reports 8 (2018). Ferrario M. et al. “Mortality prediction in patients with severe septic shock: a pilot study using a target metabolomics approach.” Scientific reports 6 (2016): 20391. In these works, we examined plasma metabolome, proteome and clinical features in patients with severe septic shock enrolled in the multicenter ALBIOS study. Mass spectrometry-based targeted metabolomics and untargeted proteomics allowed us to quantify absolute metabolites concentration and relative proteins abundance. We computed the ratio D7/D1 to take into account their variation from day 1 (D1) to day 7 (D7) after shock diagnosis. Patients were divided into two groups according to 28-day mortality. These works showed the importance of circulating lipids and coagulation cascade (proteomics) in septic shock progression, thus capturing a further layer of biological information complementary to metabolomics information. Bauzá-Martinez J. et al. “Proteolysis in septic shock patients: plasma peptidomic patterns are associated with mortality.” British Journal of Anaesthesia (2018). We analized intensive care patients with septic shock (n=29) or sepsis (n=6) and non-hospitalised subjects (n=9) recruited as part of the prospective observational trial ‘ShockOmics’ (ClinicalTrials.gov Identifier NCT02141607). A mass spectrometry-based approach was used to analyse the plasma peptidomes and the origin of circulating peptides from proteolysis in the enrolled subjects. Evidence of systemic proteolysis was indicated by a larger number of circulating peptides in septic shock patients, compared with septic patients and non-hospitalised healthy subjects. The peptide count and abundance in the septic shock patients were greater in patients who died (n=6) than in survivors (n=23), suggesting an association between magnitude of proteolysis and outcome. In silico analysis of the peptide sequences and of the sites of cleavage on the proteins of origin indicated a predominant role for serine proteases, such as chymotrypsin, and matrix metalloproteases in causing the observed proteolytic degradation. Systemic proteolysis is a novel fundamental pathological mechanism in septic shock. Plasma peptidomics is proposed as a new tool to monitor clinical trajectory in septic shock patients. Aletti F. et al. “Peptidomic analysis of rat plasma: proteolysis in hemorrhagic shock.” Shock (Augusta, Ga.) 45.5 (2016): 540. A shotgun label-free quantitative proteomic approach was utilized to compare the peptidome of plasma samples from healthy and hemorrhagic shock rats to verify the possible role of uncontrolled proteolytic activity in shock. Plasma was collected from rats after hemorrhagic shock (HS) consisting of 2-h hypovolemia followed by 2-h reperfusion, and from healthy control (CTRL) rats. A new two-step enrichment method was applied to selectively extract peptides and low molecular weight proteins from plasma, and directly analyze these samples by tandem mass spectrometry. One hundred twenty-six circulating peptides were identified in CTRL and 295 in HS animals. Ninety-six peptides were present in both conditions; of these, 57 increased and 30 decreased in shock. In total, 256 peptides were increased or present only in HS confirming a general increase in proteolytic activity in shock. Analysis of the proteases that potentially generated the identified peptides suggests that the larger relative contribution to the proteolytic activity in shock is due to chymotryptic-like proteases. These results provide quantitative confirmation that extensive, system-wide proteolysis is part of the complex pathologic phenomena occurring in hemorrhagic shock. Braga D., et al. “Preliminary profiling of blood transcriptome in a rat model of hemorrhagic shock.” Experimental Biology and Medicine 242.14 (2017): 1462-1470. A pilot analysis using paired-end RNA sequencing was used to identify changes that occur in the blood transcriptome of rats subjected to hemorrhagic shock after blood reinfusion. Hemorrhagic shock was induced using a Wigger’s shock model. The transcriptome of whole blood from shocked animals shows modulation of genes related to inflammation and immune response (Tlr13, Il1b, Ccl6, Lgals3), antioxidant functions (Mt2A, Mt1), tissue injury and repair pathways (Gpnmb, Trim72) and lipid mediators (Alox5ap, Ltb4r, Ptger2) compared with control animals. These findings are congruent with results obtained in hemorrhagic shock analysis by other authors using metabolomics and proteomics. The analysis of blood transcriptome may be a valuable tool to understand the biological changes occurring in hemorrhagic shock and a promising approach for the identification of novel biomarkers and therapeutic targets. Impact statement. This study provides the first pilot analysis of the changes occurring in transcriptome expression of whole blood in hemorrhagic shock (HS) rats. We showed that the analysis of blood transcriptome is a useful approach to investigate pathways and functional alterations in this disease condition.